Two Friends. Two Books. One Book Trailer! TOO MUCH! NOT ENOUGH! is available now. NOW? NOT YET! comes out on June 4th. Check my events page for my upcoming readings. 1. KIDLITCON 2019! Last weekend I attended KidLitCon, and participated in my first panel. Along with Andrea J. Loney, Alison Goldberg, Gaia Cornwall, Jannie Ho, and Emma Otheguy and moderated by Charnaie Gordon of Here Wee Read, we talked about the ups and downs of our picture book debut year. I’m not going to lie. I was very nervous. But I am so glad I had the chance to share some of my debut story. The whole conference was really amazing. It was a small group (about 150 attendees) and a mix of bloggers, publishers, librarians, and authors. I met so many new and wonderful people in person. It was a very happy, laid back vibe overall which I greatly appreciated. I learned so much in different workshops over two days and felt extremely lucky (and inspired!) by keynotes LeUyen Pham and Varian Johnson. 2. EXETER LIT FEST Next weekend, I will have a chance to be on my second panel (here’s where I will see if experience will make things a little less nerve wracking!) at the very first Exeter Lit Fest. Together with authors Lisa Bunker and Paul Durham we will talk about our experiences in kidlit. The whole schedule is remarkable and can be viewed here. 3. MFA APRIL VACATION WEEK The following week I am pleased to share that I will be part of the Boston MFA’s April Vacation Week programming, along with fellow author/illustrator Jannie Ho. We will both have two interactive, all-ages presentations celebrating the Art of the Story. See dates, times, and details here. 4. ON MY DESK Despite rumors that Mercury Retrograde would halt all progress, I have been very busy this month revising two early reader / graphic novel projects as well as pulling a new picture book dummy together. It feels great to switch gears between these books and see them evolve and improve. The picture book came from smack dab in the middle of this year’s Storystorm month. Looking back, I can see where I built ideas up in the first two weeks only to find this gem in the middle. Thank you, Tara Lazar for creating the arena for idea generation! 5. WHAT I AM READING Lastly, I wanted to share what I have been reading. 1) I beat down a path to get Lucy Knisley’s KID GLOVES when it came out last month. I adore her instagram feed and love watching videos of her cute boy and cat Linney with my daughter. It’s an amazing graphic novel - I love the way she wove her own journey from pre-pregnancy through birth with the history of pregnancy and myths. It’s honest, sweet, funny, and eye opening. 2) I picked up Science Comic The Brain when I was at KidLitCon and met illustrator Alex Graudins. My daughter and I love this series - they really are all so well done. I love the characters and narrative set up contrasted with the illustrated science of the brain. 3) I am about a 1/4 through Jo Knowles latest book, Where the Heart Is and can’t wait until tonight to dig back into the story. I did a lot of the rough sketches on my iPad. I am the rare artist who doesn’t like drawing on my iPad, but I was grateful that I could work even while out for afternoon activities with my kids. Below are very rough sketches for two pages, followed by their finals. The page design and content were revised after first sketches, as well as art edits. 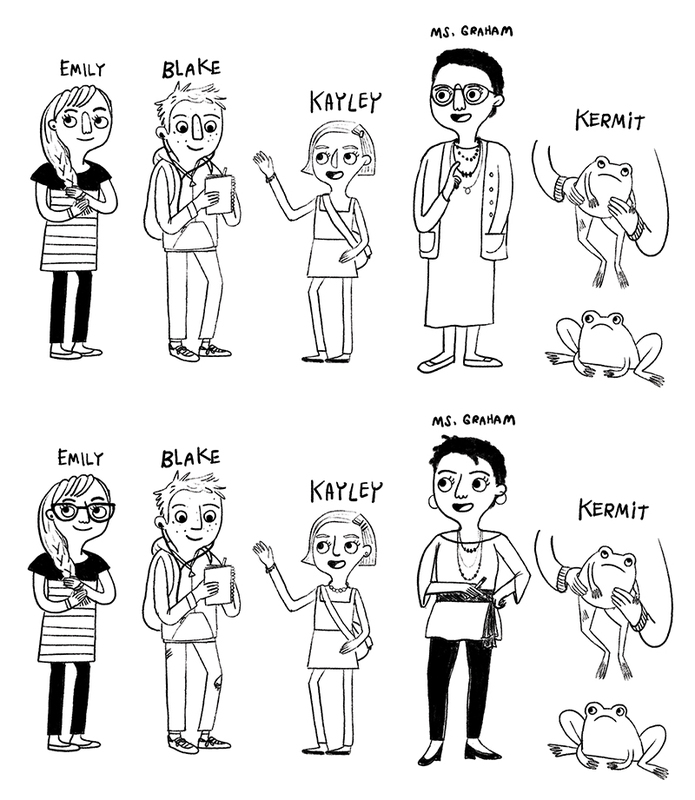 PSIS208 Queens, NY - Drawing and Writing after our Skype! 1. WRAD: This was my second year participating in World Read Aloud Day with Skype calls in New York, Connecticut, Texas, the Ukraine, and Florida! Below are the books I shared at the end of our talk. I love seeing so many happy students and answering their questions about writing and illustrating. 2. HANK! We have a new member of the family. 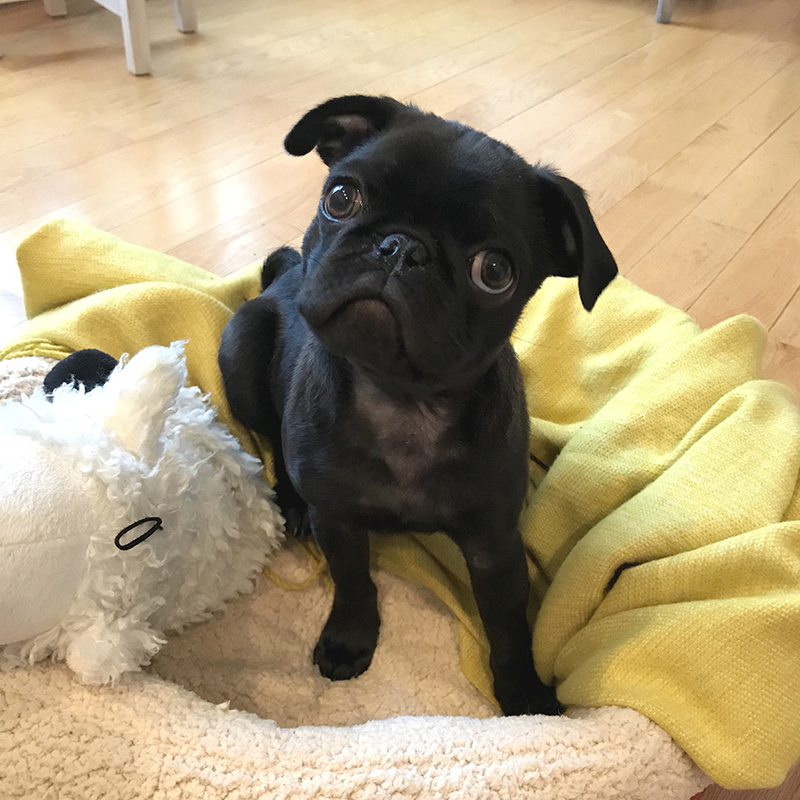 His name is Hank and he is a 3 month old pug puppy. We all picked favorite names before he came home, but none of them fit until my son said, “What about Hank?” and it just fit. Miles had just finished reading FRONT DESK by Kelly Yang, and liked the name from one of the characters in her book. He is a funny, cuddly dog who loves to get toasty warm and isn’t so fond of our New Hampshire winter. EXTRA BONUS: He has already given me lots of new book ideas. 3. FROG! Stay tuned for more all about Operation Frog Effect. I was lucky enough to do the interior illustrations for Sarah Scheerger’s middle grade novel and it comes out February 26th. Andy Smith illustrated the cover. It’s been getting awesome reviews and I’m not surprised! I will post a bit next time about how I developed the characters and what it was like to work on such a different project. a) Donate Blood regularly: Check! Until I got sidetracked by anemia. But after a few months of iron pills, I hope to get back to it soon. b) Try a spin class: Check! I love my local spin studio and it’s been an fun and healthy habit. c) Eat healthier: I wasn’t doing well with this until the Fall (I ate my moving stress!) then I joined NOOM and lost 12lbs. But more importantly, I feel like I really learned HOW to eat. d) Visit the Isles of Shoals: I TOTALLY forgot about this resolution, so it goes to the top of the pile for warmer months in 2019! e) Less ‘Internetting’: Oh, I failed this entirely in 2018. But I’m doing MUCH better in 2019. 5. NEW RESOLUTIONS: This year I would love to travel more. AND, to adopt the mindset I will call NO DOUBT. I wouldn’t say I get easily discouraged, but I do have a tendency to doubt myself when a project gets rejected or I’m not as busy with projects as I’d like. If my mindset was NO DOUBT, I wouldn’t waste a beat on quiet times, but get working on all those great projects I didn’t have time to work on before. Piccola! I can hardly believe how cute this is. SMALL is now available in Italian! This girl is going places! I am 1/2 Italian and think my Nana Perry and Auntie Louise would have been pretty excited about this. 2. Live Painting with 2nd Graders! I visited my daughter’s classroom this week. They are writing and illustrating their own stories. Their teacher gave them a few ideas about illustration styles they can follow and I got to throw them a colorful wrench with my style. I showed them my messy palette and left them with gouache and brushes to try out. They had great questions, were so well mannered, and I can hardly wait to see what their books look like! 3. Timberlane Literacy Night Next Thursday I will be hanging out with local authors, meeting students, and signing books. I’ve slowed down my event calendar which has made me appreciate every chance I get to meet young readers. I hope to see you there - details, here. 4. Building Stuff This industrious kid will be making her way around to publishers next week in the form of a postcard. It’s November, but it’s the first postcard I’ve sent in a year. Oops! It was a busy year, though! 5. In the beginning I’m working on a new story. I had a flash of inspiration this spring when I was WAY too busy to go off track. But I just couldn’t ignore my excitement so I spent a day noodling around with this idea and built it into a bigger idea. I spent another week or so thinking of a plot whenever I could find a spare minute. I was SO excited about this project! Then, when I finally had time to return to it, it just wasn’t working as a picture book. I was frustrated and grouchy and started sinking into that whole ‘I have no more good ideas, I should quit’ pity party. A few weeks later, I am finally back on track. Do you know how? I sat down and I did the work. <—Those are Julie Falatko’s words. Go follow her daily Instagram stories if you want a solid reminder of how important doing the work is compared to brilliant flashes of inspiration. And go buy her new book, No Boring Stories! out this week. TOO MUCH! NOT ENOUGH! is a Read Out Loud video (and podcast!) for KidLit TV! Special thanks to Julie Gribble, Sam Devotta, and KidLit TV for making the magic happen! In other book news, I will be at Strawbery Banke for their annual Children’s Literature Festival from 11-3pm this Saturday. I will be joined by lots of other talented authors and illustrators and it’s always a fun family event! Admission to the lit festival is free, and their Fall Festival goes on at the same time and looks fabulous. 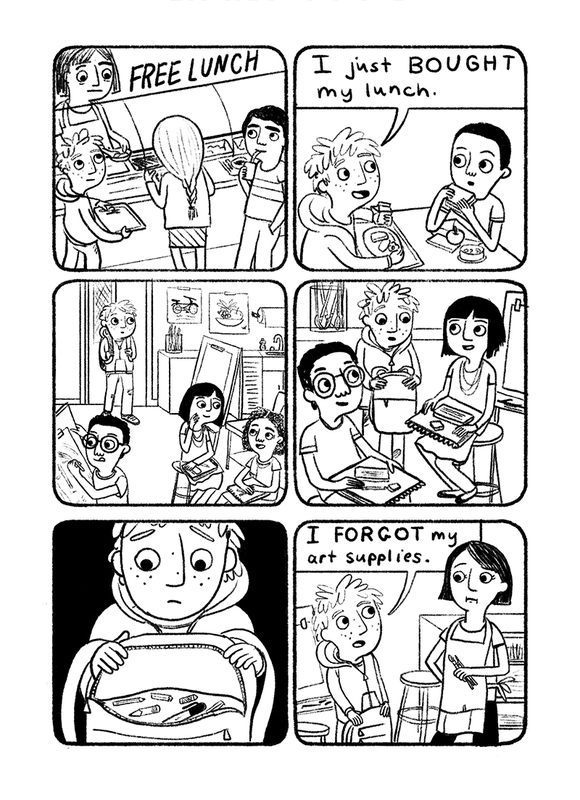 I finished this Meet The Artist promo piece this summer and it just went around to editors last week. It was fun to illustrate my kids - they grow so fast, even this seems like forever ago. It also gave me an excuse to teach them about the Renaissance man (ahem, and woman). I packed another “fluffernutter with apple slices” again this morning, so not everything has changed! I’m excited to share two fun projects I worked on coming out in 2019. First up, I created interior illustrations for OPERATION FROG EFFECT, written by Sarah Scheerger, coming from Random House on February 26th, 2019. The book is fantastic and is getting great early reviews (I love this description: “Operation Frog Effect is like The Breakfast Club for middle schoolers. It’ll make you laugh, cheer, and strive to be a better person.” —Shannon Hitchcock, author of Ruby Lee & Me and One True Way). It’s told by eight students in journal format. One student prefers to draw his entries - which is where I come in. 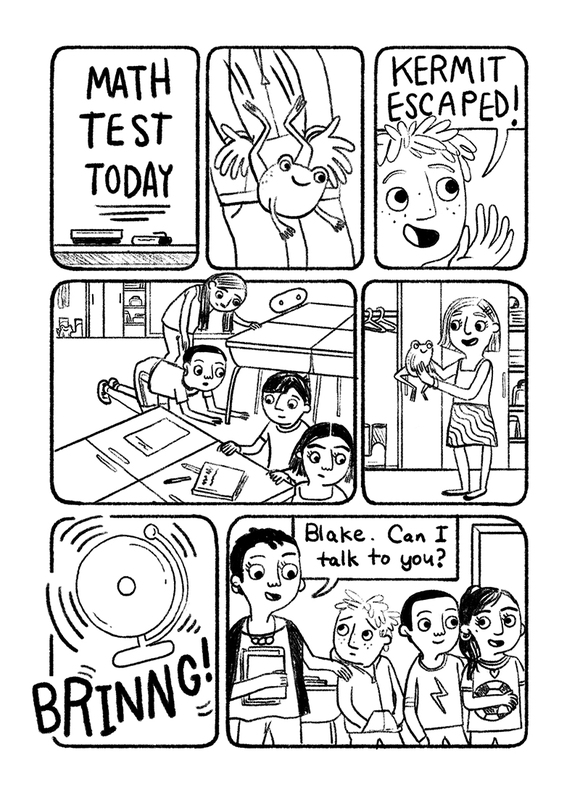 I loved working in this style and can’t wait for another middle grade project to land on my desk. Next up is my picture book Now? Not Yet! Coming out on May 14th, 2019 and just in time for hot summer days where you dream of cool lakes and camping with friends. I just loved returning to my dear monster friends’ world one more time. It’s full of extra surprises and silliness and lots of Peanut energy. I’ll be sharing inside peeks at my process for each of these books in the new year. In the meantime, I’m working on top secret NEW projects with NEW friends that I am really excited about. I just have a few more events lined up this fall. Come join me with Jannie Ho and Jennifer E. Morris at Toadstool Bookshop this Sunday at 2pm. OR, check out the Strawbery Banke Children’s Book Festival on October 6th from 11am-3pm (admission is free) to meet me and lots of other fine authors and illustrators! In celebration of National Peanut Day, I’m giving away three copies of TOO MUCH! NOT ENOUGH! to teachers and librarians (US only). The first three comments on this blog will get a copy and extra classroom goodies! To say it’s been a busy month is an understatement. The same week that TOO MUCH! was released my family and I moved from our home of 16 years. We didn’t go far, we really love our town, but we still had to pack up all that stuff. AND host a launch party at Water Street Bookstore. THEN unpack (in theory, that part is going REALLY slow) and adjust to a new home, a new school year starting and lots of fun Peanut & Moe book parties. If you’ve missed the fun, don’t worry. Join me (and Jannie Ho and Jennifer E. Morris) on September 23rd at 2pm at Toadstool Bookshop in Milford, NH. OR! Come to the Strawbery Banke Children’s Book festival during their Fall Festival on October 6th from 11am-3pm. Admission is free for the book festival and there will be a room full of authors and illustrators. *I’m celebrating National Peanut Day by making muffins. It’s on the rainy day fun fortune teller, make one for yourself, here, on page 3.